Another one, luckily Mohammad R. Daoud has got an answer to this issue. Once GP2010 R2 installation is over and GP Utilities start configuring system, almost the last setup is SRS Reports Deployment wizard. It’s a welcome change from previous versions, as this one is more explanatory and clear. The message is self-explanatory on what needs to be done to get rid of this message. 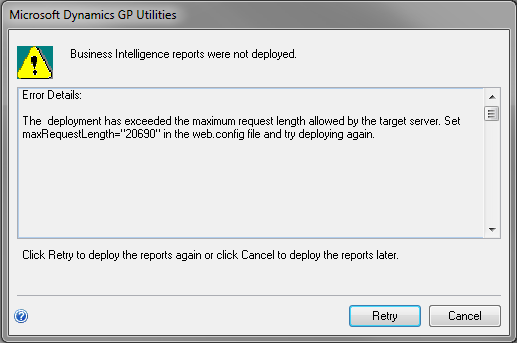 To understand how to find WEB.CONFIG file, read Mohammad R. Daoud’s post; Dynamics GP 2010 R2 Business Intelligence Installation Error maxRequestLength﻿. Thanks Daoud. It was really helpful. This entry was posted in BI, GP 2010 R2, Reporting, SSRS and tagged GP 2010 R2. Bookmark the permalink.